The Road Transport and Safety Agency has warned Power Tools Bus Services that their road service licence risk being suspended should the company continue defying the provisions of Statutory Instrument number 76 of 2016 which restricts the movement of Public Service Vehicles at night. On January 10th 2019, RTSA requested Power Tools Bus Services to show cause within seven days why their road service licence should not be suspended or revoked for defying the provisions of SI Number 76 of 2016. This was in the wake of a road traffic crash that happened on 28th December, 2018 around 04:22 hours, involving a power Tools bus registration number ALD 1807 were one person died and five injured. 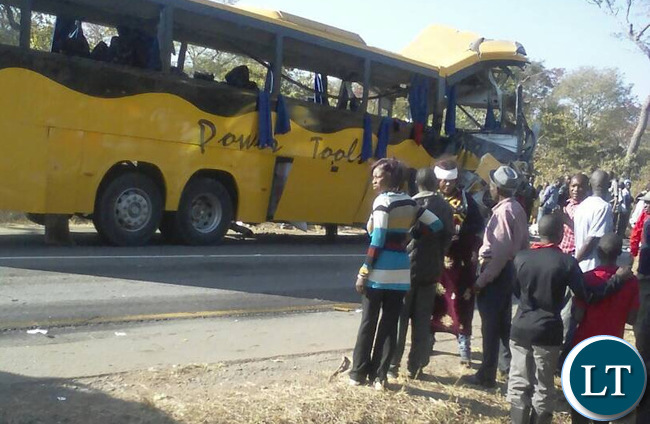 The crash occurred along the Kapiri Mposhi – Ndola road, 20 kilometers from Ndola at Rainbow area. Power Tools Bus Services in their submission to the RTSA in a letter dated 14th January 2019, assured the Agency of enhancing effective monitoring through the use of Global Positioning System to monitor the movement of the buses to reduce the rate of violations on the part of the drivers. The Company has further put in place a policy banning night driving and all drivers have committed by appending signatures to adhere to the policy. In view of the latter and subject to complying with the conditions stated, the RTSA has decided to give Power Tools Bus Services a benefit of doubt, and will not suspend its road service license. Further, RTSA has directed the company to grant the Agency access to the GPS so that the RTSA could constantly monitor the movement of all buses belonging to Power Tools Bus Services. The Agency is closely monitoring the company’s operations and should any of the drivers be found driving outside the permitted hours or should there be any circumstance relating to the company’s operations that endangers the lives of the travelling public, the Agency will not hesitate to suspend the road service license. This is contained in a statement issued to the Media by RTSA Head of Public Relations Fredrick Mubanga. What are rules for. This case should have gone to the courts. These guys are killing people by way of sacrificing their lives. Can the accident victims and their close families sue this power tools and see if they will escape it. Ratsa have taken a bribe to come up with this judgement.